Sometimes first impressions can be deceiving. 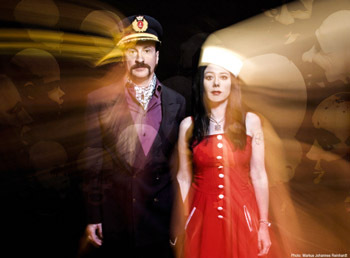 Take Alexander Hacke and his long time partner Danielle de Picciotto. As the two walk towards the picnic table where I am seated, they look like consummate rock stars: Hacke with his lanky build, handle bar moustache, long, black hair stuffed under his straw cowboy hat, Hawaiian t-shirt and army shorts and De Picciotto dressed all in black. In short, they look intimidating and a little fearsome. This would be fair assessment to make about Hacke, the bassist and music director for German industrial pioneers Einsturzende Neubauten and de Picciotto, an American artist/musician/film maker, who co-founded Berlin's Love Parade in 1989. But of course, they are from it. Instead, they are a warm, gregarious and very funny pair that lovingly finishes each other sentences, debunking any notion one might have about serious sturm and drang artists from Berlin. Hacke may be better known for the experimental, abrasive, cacophonous music he has created with Neubauten since 1980, made on scrap metal custom-made instruments and building tools, as well as conventional rock musical instruments. But together with de Picciotto, they are also a powerful and imaginative, creative couple whose artistic creativity refuses to be encumbered by any stylistic boundaries or mediums whether it be in film, theatre, music, video, installations. Their latest collaboration is the multi-media show, The Ship of Fools, based on medieval writer Sebastian Brant's novel of the same name. PSF: Alex, talk to me about your musical background? Did you come from a musical family? Hacke: Not really. I inherited my first drum kit from my great grandfather. He was musician who survived both world wars. I got kicked out of many high schools. It was hard for me to stay in one spot. I finally went to a special school for musically artistic but behaviorally challenged children. There I had the key to the band room and I would lock myself in for days as I wouldn't attend as any other classes. I tried proper guitar and drum courses. Actually, the class I enjoyed the most was drum class. The guitar I learned myself. I used to play along to all these punk records: The Stranglers' Black and White was one of my favorite drum-a-long records. With the advent of punk rock, I knew I wanted to be a musician. Before punk rock, I was into space rock and tape experiments, but punk rock fit into the onset of my puberty and all the anger and rebellion and stuff. I really liked American punk rock. I learned English from The Ramones. I liked the Germs. That's when I knew I wanted to be a musician and take it further and that's when I got involved with the boys in Neubauten in 1980. PSF: In 2005, the two of you worked with the trio, The Tiger Lilies on the multi-media project The Mountains of Madness. In light of the success of that production, what was the impetus behind Ship of Fools? Hacke: We are completely against any ghettoization of styles and genres. We are mostly interested in creating a clash and a friction between different art forms and musical styles. And we were looking for a framework to do just that. And Ship of Fools was just kind of foundation. PSF: Alex, since you played country cover songs in the Jever Mountain Boys and Danielle, you've work with Die Haut, I'm wondering, why people would still ask that question? de Picciotto: I mean every fool is described with a different type of music and that's on purpose. Greed is country. Anger is black metal. So we were thinking what kind of music style would fit what fool and what kind of musical style we would enjoy doing. How can we do something that shows every aspect of our work? We first decided what fools we were going to use and then we would Google 'greed' and when you do that, you get everything on the subject from every perspective- philosophy, religion, sound. And then we would sit here for hours and figure how to match the words with music. One of us would play a chord. That fits with that. We didn't have a set idea of what would happen, except I knew I definitely wanted to do something with a Tiki theme within the show. Alex: I knew with greed, I wanted to have something that had a fast-paced, a rockabilly rhythm but program it electronically. I knew I wanted to create that friction of having American roots music but programmed electronically. Basically, our goal was to create a piece where the audio and visual aspects are equal. de Picciotto: So we said, 'let's try to do a project where the audio and the visual are perceived to be equal.' Because if you're doing a film score, the audience usually doesn't pay much attention to the music and in a musical concert, they don't take the visuals as seriously. They do that automatically. We're trying to train the brains of our audiences so that they can be exactly one thing. That's what we're about. It's the Flannery O'Connor line: my arms are like the visuals, my legs are the music and we're the one body of all these things and one element isn't more important than the other. It's all inter-connected. He does his film music scores and his music with Neubauten and I do my exhibitions and my movies. So we have our different realms of work but together. PSF: Alex, you've done several film scores, but many people became aware of you outside of Neubauten through your acting role in the 2005 movie: Crossing The Bridge: The Sound of Istanbul. How did that come about? Hacke: I knew (director) Fatih Akin from the Hamburg nightlife and he runs a production company. His partner used to be Neubauten's manager and that's how my first work, doing for the music for Fatih's Head On movie, came about. He liked my work on that project, so he asked me about doing Crossing The Bridge. Fatih saw how well I got along with these Turkish musicians and he was taken with my dedication to the project. It's not a music that can necessarily be understood by a European ear, to understand different rhythms. It was a wonderful experience. PSF: You took an interesting approach with your 2005 solo disc, Sanctuary, inviting with the likes of David Yow, J.G. Thirlwell, and Casper Brotzmann. It has been compared to a musical travelogue. Can you discuss the process behind Sanctuary? Hacke: It was a conscious decision to make a record the way a director makes a road movie. The characteristics of a road movie are that there is not a finished script. You write the script while you're travelling. You also involve the people you meet along the way. So Danielle travelled around the world and I was lucky enough that I had a publishing deal advance that I went through in no time (laughter). We would go one place and meet someone. I would jam and record music and then on our journey to the next place, I would take out these recordings, mutilate and process them. So when we got to the next place, it was not a one-on-one documentary snapshot of where we had been before. It had been transformed on the way. So that at the new place, I could not bring a new piece of culture removed and transported but something new and unique and that could stand on its own. So that is something we learned, that there are different approaches to producing music. It doesn't necessarily have to be the standard writing, rehearsing, recording, mixing process, but it can be in a different order. Also, that is the reason why this record is called Sanctuary. Music has been floating around in ether and it finds a sanctuary within the record. This is the place where this wandering music can find a safe haven in one place. Also, by working this way first of all, I could work with musicians on the same piece of music that I could otherwise not afford to do: get them to Berlin, feed them, accommodate them and pay for their fees. This way I could connect people with each other, within that music that would have never played together like an Italian pop star, Eichen with me and Michael Evans. And when you're traveling around and recording with these people in their surroundings, it always has a different quality to it than if you were just recording in the studio. Even if you can't quantify it, it has that special magic to it. PSF: I was wondering if we could talk about Neubauten for a few minutes. Alex, for Neubauten's latest album, Jewels, I understand part of the creative process involved using John Cage-like cue cards. The interesting thing was the results were non-stereotypical of Neubauten because the cards would tell you to do things that you definitely wouldn't have done usually. They present you with a strategy that is completely out of your own imagination or instincts. On one of the first pieces we did, Blixa drew the card that said “At home a dream” and he kept that theme of dreams throughout the whole project… dreams have a similar analystic logic… dream narratives are often where very weird things are happen. PSF: How many cards are there? Hacke: There are about 600 cards. Blixa wrote them. He is really the structuralist of the band. It's a game of interpretation. You are not supposed to take everything literally. So one card could say backward and could it mean backwards, but it can also mean a backwards attitude: I'm going to be really conservative and old fashioned in my approach. PSF: Were you aware of John Cage's notions of indeterminacy using I-Ching charts? Hacke: Actually, for most concepts that I would come up with, I would find out later that they had already been invented. I had already come up with the concept of Dada before I knew that it existed. I don't know what it was like with the others, how educated they were when we started. I know certain things were unknown to Blixa, others he already had a concept of before. De Picciotto: I think that is one of the common denominators that all of you in the Neubuaten possess: is to break up or down things, sounds, ideas, and concepts. Einsturzende Neubauten: the idea of the band is within the name. Even the way Alex discovered Dada. It is by calling things into question and destroying the concept or doing something that you're not supposed to do with it. You, Blixa and Andrew always work like that. No matter what you do, you're always doing what you're not supposed to do. And that's how things develop or are born. You're all very different, but that's what unites the three of you. PSF: Correct me whether I'm right or wrong, but is it true that one of the reasons that Andrew Chudy (N.U. Unruh) began building his own instruments out of scrap metal was because he lost his drum kit. Hacke: Yeah, he sold his drum kit. The first time I played with him, Andrew was playing a proper drum kit and in that year he had to sell it because he couldn't pay the rent any more. So he had to find something else to make noise with. When I first met him, he would only listen to Beatles records on a stereo where the speakers were covered with aluminum foil because he actually liked the rattle of the foil when listening to this music. He wanted to add a new element to this music that he had been listening to since he was young. Yes, these instruments develop a character of their own. They are like a person with their own sense of drama. Of course, the bass spring, for example, is a central character to this being called Einsturzende Neubauten. Without that particular sound, the sound of Neubauten would be completely different. Also, with Andrew in particular, sometimes it is just his presence that shapes and changes the sound of the music. The fact that he decides not to do certain things is important to Neubauten's music. There is a Neubauten tune from the 1983 album, Drawings of Patient O.T. called “Vanadium-I-Ching." That came about when Andrew was standing in the room, while everyone else was playing and he was holding these wrenches and he suddenly he dropped these tools and then he did it again. Initially, they slipped from his hands and Blixa made a mental note of what he is doing and said it was like throwing an I-Ching. Since wrenches are made out of vanadium, which is a type of metal, so the track became "Vanadium-I-Ching." If Andrew hadn't been in the room and hadn't decided not to play because he wasn't participating in creating the rhythm or structure and decided to just stand there and drop some tools once in a while, you wouldn't have had this essential element of the composition. You cannot control the man. Sometimes if you try to push him into finishing what he has been talking about doing, he makes sure that it will never happen. It is very unpredictable, entertaining and surprising what he'll do. PSF: What is the distinguishing line between composition and improvisation? Hacke: It's a game of trial and error. The long version of the story is that the old version of Neubauten never worked with a playlist; we only had an opening song and we had a good idea of what we would finish with. In between, it would be either completely free improvisation or somebody would pick up an instrument and start a rhythm and that the others would recognize as ‘Ah, he wants to play that song, so we might as well follow him or not.' This is where we developed a language of how to trigger certain pieces of music, how to make each other do certain things. For example, if I wasn't paying attention, Mufit (F.M Enheit) would spit at my back. Splat! This piece of gob stuck to my back. (laughter) So we had these various methods of communication. So when Mufti and Marc Chung split the band and the two new members joined, it would have been unfair to continue working in that way because they weren't acquainted with that language. So we started working with set lists. There are different ways how a Neubauten song is conceived. One is by improvisation. The other is by someone coming up with a new instrument and we start a song about the character of the sound of the instrument and third way is if there is a certain image, line or title that Blixa comes up with. Usually, there aren't finished lyrics. Blixa usually comes up with a concept that only he can describe in a couple of sentences and then we brain storm, keeping in mind what it is supposed to be about. PSF: In the end, are your sounds 'noise' or 'music'? Hacke: One of the oldest concepts of Neubauten is to expand the term 'music' until it comes to the point where everything has become music, which also indicates that nothing is music anymore. PSF: When the new members Jochen Arbeit and Rudi Moser joined the band, you mentioned that you moved from more improvisational live shows to more structural live shows. A lay person would say the sound of Neubauten also went from being more aggressive to more textural. Was that because of what the new members brought to the group or is it simply the evolution of musicians playing together for 30 years? Hacke: Yes, but also learning about economy: channeling of energies. The more mature and experienced you get, the better you get at channeling your energies. Like when you're a younger boxer, you're very aggressive but you're not smart about conserving your energy, whereas a more experienced boxer will knock you out with a well-placed punch. It might be a less impressive display of energy and power but it is more effective. And I think that is the same with Neubauten: we know how to get you without losing too much energy. PSF: As your music has become less raw and confrontational, I understand you've come more interested in the science of sound, in acoustical research. Hacke: You can point out a former, recent or future member of Neubauten by the way they step on everything. I wear these heavy rings so that I tap on everything. I think it is important for you to train yourself to be constantly aware of the sounds around you and in your environment. Everything has a resonance and a frequency. This is something that Neubauten are aware of and attuned to. Also, accidents happen. We have this great old tank in the studio that we use as a percussion instrument. One day we forgot there were microphones on in there and we realized that it makes a fantastic artificial room in the studio, so our reverb chamber is this gigantic septic tank that sits in the corner of the room. PSF: What is the oddest instrument that Andrew has created? Hacke: There is always a battle between the practical and the impractical and he is very much involved in that battle within himself. He would like to do things a certain way but then a voice inside him says 'but it has to be practical.' You have to be able to break it down and transport it to shows. But then sometimes there are funny mistakes. Once we had a great sound from this blue bin that has travelled with Neubauten for long time. Andrew was thinking of making room to be able transport it more effectively and he cut the blue bin so we could take off the bottom of it and put it back as a lid. This of course destroyed the whole resonance of the instrument. But now that it was open you could actually put other stuff in it. So as a carrier, the blue bin was great, but it completely lost its sound. Also with inventions in the early days, one of the things I was impressed with what he built and invented a short circuit plug, which is a rubber coated electricity plug where the plus and minus are connected to each other. You can put it in any socket and blow the fuse in any building. de Picciotto: Andrew always brings along these things to make his food with: a juicer, a cereal mixer or his toaster. It was an open air concert at the heel of Italy. It was a small town and it took all day to come up with enough electricity to run the P.A. and lights. Just when we were scheduled to go on stage, the electricity breaks down not only at the concert site, but the whole city goes dark as well. It was this one extra unit that he decided to plug in a minute before show time. It's just one of the things that happen with Neubauten. Hacke: People don't realize that there is a lot of humor in what we do. We've always had this sense of mischief and curiosity. 'Let's see what happens, if we do this.' Schadenfreude goes hand in hand with Neubauten. If we hadn't had humour, we wouldn't be around anymore.